“Just breathing can be such a luxury sometimes.”-Walter Kirn Nothing could be truer when you discover the beautiful Aroma of Pisces Incense. Specifically made to support the personality of a Pisces! The sign of Pisces means you were born between February 19th and March 20th under the sign of the two fish swimming in opposite directions. You often feel like you are being pulled in different directions. The symbol of the fish has been associated with followers of Jesus Christ. With elements of water and intuition, you are known to be creative and gentle. Some of your qualities are being creative and kind, drawing people to you. You are spiritual and emotional. Your compassion makes you a great friend to talk to. The most compatible signs with Pisces are generally considered to be Taurus, Cancer, Scorpio and Capricorn. You are ruled by the planet Neptune, the planet of fantasy, creativity, dreams and psychic receptivity and sometimes confusion. You are also ruled by your feet, lymphatic system. Pisces are sponges absorbing toxic energy that can affect their immune system. You can be sensitive to drugs, alcohol, and substances of any kind. Your specific Pisces scent in the incense is a blend of freesia and coconut to match your sensational creative personality. These two beautiful scents come together and excite your natural open-minded self! You are imaginative, making you a great storyteller. You are also sensitive and sympathetic having these qualities helps in being a good a caring parent. Sometimes wanting to escape the everyday drudgery you may day dream or sleep to use your mind in an artistic and imaginative way. 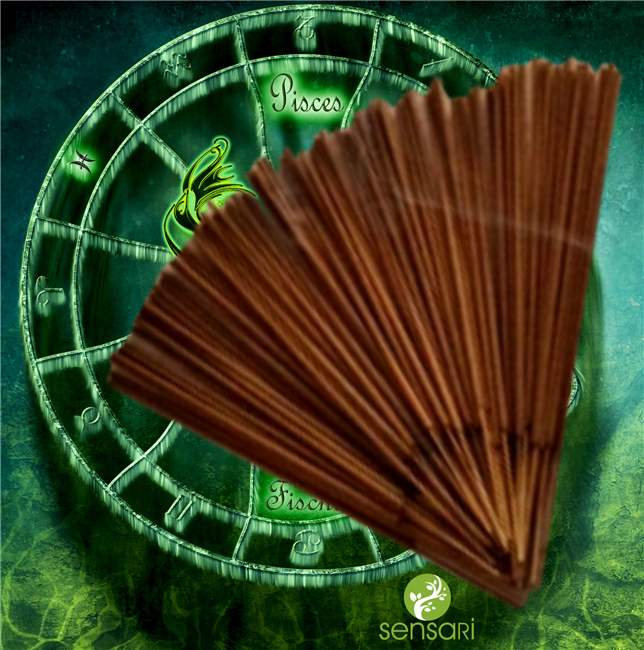 Continue your adventure with your special Pisces incense, supporting the real you!